Across the country, billboards where you might expect to see a product being advertised are instead promoting one important announcement: Be happy. 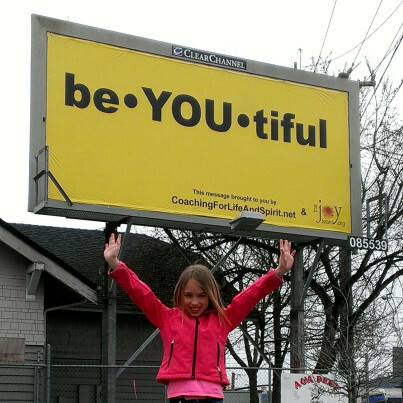 Michele McKeag Larsen began sharing kind phrases on billboards with her nonprofit organization The Joy Team in 2010, and has since posted more than 100 messages throughout the cities of Vancouver, Washington; Portland, Oregon; and Phoenix. The positive thought organization has also expanded its efforts beyond the billboards over the past five years, spreading happy messages through the world via sidewalk chalk and social media, and bringing joy and nutrition to children struggling with food insecurity. "The more you surround yourself with positive messages, positive images, positive people, the better life gets," Larsen, 46, told The Huffington Post. "Sometimes the people who need it don't realize that they need to go looking for it, and so stumbling across it and feeling that shift, or seeing it because the billboards are up for four weeks, starts to change something in their brain. And if that's the little leg up that they need to move in a different direction, that's pretty powerful stuff." Larsen's inspiration for The Joy Team arrived in the fall of 2009 when she came across a local bus shelter that, in place of typical advertising, had a simple, painted handshake with the words "Peace Jam" displayed on the glass. She was searching for happiness of her own after falling into a depression when she shut the doors on her magazine venture in 2007. She had been taking pictures of beautiful images and phrases in her natural environment that helped bring a smile to her face when this billboard caught her attention. "There was no website, no call to action, no nothing -- just shaking hands and the words 'Peace Jam,'" she said. "And I was really struck by that. As I wrote about it, I thought there should be an ad campaign for peace, love and happiness, because it was so nice and refreshing for me to see that in a place where I'm used to being sold French fries or beer or a new cell phone. Instead, it was this positive message asking nothing of me." Larsen spread positive messages of her own for the first time several months later with the help of her daughter, Taryn. After making 75 inspirational notes together, they set out to share them on park benches, on tables in coffee shops, in bookstores and in emergency room bathrooms in Vancouver. They called themselves The Joy Team that day, and began thinking of ways to expand their impact on the community beyond those 75 cards. In February 2010, Larsen officially founded The Joy Team, a 501(c)(3) organization that continues to spread these positive messages today but on a much bigger scale. Using her experience in marketing and advertising, Larsen decided to use public service announcement billboards to disseminate her messages -- advertising that you can't turn off or avoid reading automatically as you drive (or walk) by. While the group is based in Vancouver, most of the billboards are posted in Portland just across the river. Larsen (left) with her husband, Brian (center), and daughter, Taryn, in front of one of their billboards. "Words have always been very important to me," said Larsen, who earned her undergraduate degree in English literature. "I'm very moved and motivated by words and poetry and prose, so it's kind of a natural thing that I would eventually end up trying to motivate and inspire others through words." Larsen original funded the billboards with her own money, as well as that of supportive family and friends who were willing to donate, but it didn't take long for other local businesses and organizations to take notice of the bright yellow advertisements and offer to sponsor them. Larsen comes up with the messaging herself, continuing to take the time to find things that are inspiring to her each day and then share them with others. Larsen's daughter, Taryn, posing in front of one of the billboards. Everyone at The Joy Team participates on a volunteer basis; even Larsen maintains a separate full-time job as a state director of communications for March of Dimes. However, the team's initiatives continue to grow every year. It added Chalk the Walks in 2011, designating the third Tuesday in August as a day to spread positive and inspirational messages on sidewalks across the world with colorful chalk. In 2012, the team gathered the Junior Joy Team, a group of children that helps teach others about the importance of generosity, community and sharing joy with those around them. Next came PB&JOY in the fall of 2013, The Joy Team's partnership with local food banks and schools to help support kids living with food insecurity. And last year, the group introduced the Think Happy Rally, a call for everyone to visit each yellow billboard posted in October, take a selfie with the message and post the picture on their respective social media accounts to help further spread joy. One of The Joy Team's billboards in Portland, Oregon. "It's become way bigger than I expected," said Larsen. "I just thought we were going to put up a bunch of billboards, and I had no idea we would still be doing it five years later ... It just never occurred to me. I just wanted to put some positive messages out there in the world." And now, The Joy Team is ready for growth yet again. Its recent arrival in Phoenix is only the beginning of a national expansion of the positive messages. Larsen is currently working on plans to take the billboards to New Mexico and Minnesota, as well as scheming for a nationwide advertising campaign for the National Day of Happiness on March 20. "For a word person, it's hard for me to put it into words how good it feels to do this," said Larsen. "The feeling I get when I hear one of the billboards has made a difference in someone's day ... It just makes me so warm and fuzzy and I get tingly and I'm on sort of a happy high for a little while. Just knowing that I've made a shift for someone, I've helped lighten them up and made their day better, I've increased their sense of well-being for maybe 10 minutes. How cool it is that I can do that." "Good things are coming your way. Like, now."